When I first became a teacher at a Sheffield school, I was fresh out of university and about as full of rebellion as I ever have been. In my first job, I thought the number of school rules I had to enforce was, quite frankly, ridiculous. As students ran down the corridor with their top button undone and their ties not on, I was supposed to apprehend them and put them into detention if needs be, but truth be told I turned a blind eye and let them get on with their life. There were more important fires to fight, and enough rules to be stuck to inside the classroom without pretending to be a jobsworth police officer in the corridors. Time changed me. Ten years into the profession, most of the people I trained with have left teaching all together and my corridor tolerance is way different from those early days. If anybody puts a foot wrong, I’m onto them like a shot. I’ve learnt - or perhaps I’ve been brainwashed into believing - the apparent value of a zero tolerance approach. If teachers take care of the little things like uniform and attitudes corridor, behaviour will get better because kids will get away with less and push fewer boundaries. At least, that’s the theory. It does work, up to a point, but over the last couple of weeks I’ve been shocked about how authoritarian I’ve become compared to my former self and I’ve wondering if I should cut the kids a bit more slack. The questioning of my values started when I read a story in the national media about a school insisting on silence in corridors as students changed lessons. That’s silence. Not a classroom movement that is quiet and orderly. One that is silent. Any teacher insisting on silence in their lessons needs to go back to the manual in my opinion. 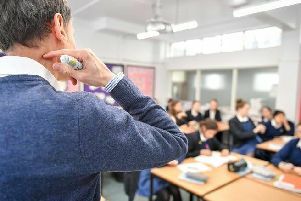 Working in silence is often accompanied by hollow threats and a broken relationship - it’s impossible to spot where every whisper is coming from and it usually results in the farcical situation of kids winding teacher up and visa versa. Often the teacher insisting on silence will dish out the ultimate unfair sanction to deal with infringements - the whole class punishment. If silence doesn’t work in the classroom, it’s certainly not going to work in the corridor. Children enjoy the couple of minutes of down time moving to a new lesson, giving them time to reflect on the lesson and generally catch up. If the lessons are good, why should we care about what is said in the corridor? As long as people are not being offended or upset, as long as the changeover is orderly, why should we care? As elsewhere in the country, the rule book at some schools in Sheffield is becoming so long and Draconian it’s starting to feel a bit Victorian, a little oppressive. Why should children be given a detention if they forget to bring a pencil? Wouldn’t it just be easier to lend them one? Why should some school children get sent home if they’re in trousers considered to be too tight? Yes, children have to follow instructions when they are in school; I’m not suggesting there should be anarchy and the kids should rule the school. But we’re starting to enter a grey area where in some situations we are treating our children like subservient minions in an environment that has far too many similarities with a young offenders’ institute. Detentions for minor offences, calling teachers ‘sir’ and ‘miss,’ strict dress code, silent time. Are these not extreme ways of treating children we should be moving away from? Having been a dedicated member of the Uniform Police and a keen Equipment Inspector, a large part of me now wants to scream out that enough is enough. We should treat our young people with esteem, throw the most extreme pages of the rulebook onto the fire and move forward utilising the power that mutual respect can bring. No good can come from enforcing pointless rules that are not proven to have any impact on education at all.